CPU card called a smart card , the card having a central processing unit (CPU), a random access memory (RAM), program memory (ROM), data memory (EEPROM) and on-wafer operating system (COS). Often divided into contact and non-contact . 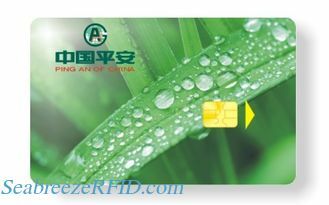 CPU card is used in many fields of finance, insurance, telecommunications, government and other industries , with user- space, reading speed, support a multi-purpose card and so on. Financial smart cards, social security cards , e-commerce smart card terminal security control module ( including ordinary PSAM card and high-speed PSAM card ), SAM card ( Secure Access Modules SAM is the core of smart card applications in the security control of ), SIM card ( mobile communications subscriber identification card , in line GSM11.11, mobile phones can not only transmit voice data , you can also conduct financial transactions , e-commerce , etc. ) . Currently contact CPU card in the social security field cable television , finance, telecommunications and other uses. Contactless CPU wafers generally equipped with the appropriate COS system . Digital TV wafer ( also known as TV set-top box wafers ) generally use less CPU wafer: Switzerland EM company EMTG56/EMTG97, American SST company ( the company has acquired a majority stake in Korea Emosyn ) of TT40/TT80/TT120/TT240, South Korea 's Samsung S3FS9SD/S3FJ9SK,esc. Contactless CPU card use in urban public transport card , passport, TV set-top boxes and other fields. Samsung 's wafer S3CC9 series CPU wafers , Infineon ISO14443 A protocol SLE66PE series CPU wafers. Because the CPU card has more incomparable advantages, very suitable for electronic wallet, electronic passbook, highway automatic charge system, the bus ticketing system, social security system, IC card refueling system, security access, and so on many application fields.Contactless CPU card will gradually replace logic encryption card and become the main selection of IC card. In under the situation of M1 card be unlock password, using CPU card instead of M1 card is the ultimate solution to solve the crisis of M1 card. As the security and capacity of the demand is higher and higher, CPU card is one of the trend of the development of smart card. Packaging materials : PVC / ABS / PET/PETG/PHA, etc. FM1208 is Shanghai fudan microelectronics(fmsh) from A single interface wafer contactless CPU card, product support agreement, ISO/IEC14443 A CPU instructions compatible with general 8051, built-in hardware DES coprocessor, data block is 8 kbyte of EEPROM memory. FM1208 is accord with the standard bank of non-contact CPU card, COS support PBOC2.0 standard and at the same time the Chinese ministry of construction of IC card application specification. FM1208 commonly used two types: the pure CPU card and a compatible M1 card. 8K pure CPU card is the capacity allocated to the CPU card completely . compatible M1 CPU card ( ie 7+1k), which is assigned to the CPU card 7K capacity use , 1K assigned to M1 card , the equivalent CPU card and M1 card composite cards.